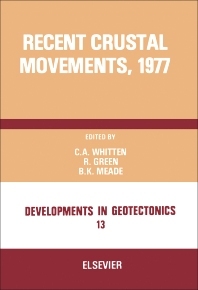 Recent Crustal Movements, 1977 is a compilation of the proceedings of the Sixth International Symposium on Recent Crust Movements. This volume is comprised of 50 papers and 38 abstracts, in addition to a special report about the RCM Symposium and the report of the Fennoscandian Subcommission. This volume is subdivided into eight parts. The first part presents the opening remarks at the symposium and the special report of the Fennoscandian Subcommission of the Commission on Recent Crustal Movements. Locations included in this report are the Estonian Soviet Socialist Republic, Finland, Sweden, Denmark, and Norway. Part two is about crustal deformation using extra-terrestrial geodesy. Part three explores the measurement of strain, tilt and gravity. The observed vertical crustal deformation is the focus of the fourth part. The second half of this volume focuses on geologic studies of Holocene deformation; observed horizontal crustal deformation; seismology; and, finally, experimental and theoretical models of interferometric methods for the measurement of distance in the study of recent crustal movements. The National Geodetic Survey project "Polaris"